AMBASSADOR Hana Simon, in her second tour of duty, has presented her credentials to President François Hollande of France. In the course of the presentation ceremony, the Eritrean Ambassador conveyed President Isaias Afwerki’s message of goodwill, and pointed out that Eritrea has good understanding as regards the role France is playing towards ensuring stability in the Horn region. She went on to indicate that the concerned parties did not play due role pertaining to putting pressure on Ethiopia for sapping the implementation of the final and binding EEBC ruling. Ambassador Hana stated that the UN sanction on Eritrea is unjust, and expressed Eritrea’s readiness to foster relations of partnership that is anchored on mutual benefit. The French President on his part said that his country has a longstanding presence in the Horn of Africa, and that it is playing positive role as regards ensuring peace as well as stability in the region. He further disclosed that it is France’s desire for the Eritrean-Ethiopian issue to obtain peaceful and legal resolution, and expressed good wish for the Eritrean Ambassador as she assumes the diplomatic responsibility. 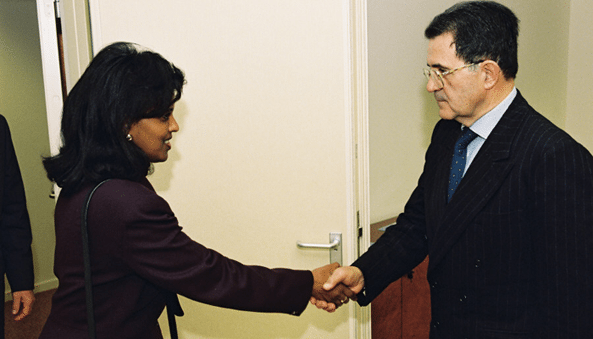 Hana Simon received her advanced education in political studies in France and later on was appointed as the first ambassador of Eritrea to France and the European Union in the laste 1990s. She was also among the first participants in the EUCLID University program when it was approved by Minister of Foreign Affairs Osman Saleh for the Government of Eritrea in 2008. She completed her Masters in Diplomacy and International Affairs in 2011 and was invited to join the faculty to teach course DIP-607 “Diplomatic Protocol and Immunities” for which she has extraordinary first hand knowledge and experience. She speaks fluent French and English.